Now that was fun. We didn't just beat the Red Wings tonight, we annihilated 'em. For the first time this season, we have ourselves a winning streak. Not only have we won two in a row, but we've secured points in seven straight games. 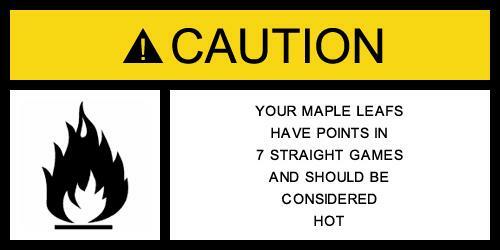 I'm now legally obligated to present you with this warning before continuing this recap. Now that that business is complete, back to the celebration. Why are the Leafs suddenly competitive? Remember, it wasn't that long ago that I wrote this rant begging MLSE for real hope. What's different? 1. Goaltending - THE MONSTER (henceforth to be written in ALL CAPS at all times) is playing great, and when you get great goaltending, it's a totally different game. Vesa Toskala cannot be the #1 goalie for this team if we want to be competitive. THE MONSTER is so much better, it's almost enough on its own to give us hope. 2. The Kessel Factor - Phil Kessel is far and away the best offensive player on this team. He makes that big a difference., and he's making others, especially Blake and Mitchell, better. It's no coincidence that pucks are starting to fill the opposing net. 3. Don Cherry Was Right - This team needed some time to gel. I'm not convinced we're a playoff team, but I know we're a great deal better than that team that was winless after 8 games. We're starting to play as a unified unit, and with points #1 and #2 above, this could get interesting. Our next victim is the lowly Wild on Tuesday night. YAY for the win...it's a twofer. Someone must have heard Jim's song on Thursday. As a lifelong Leaf's fan, even I laughed. He's going to have to update the song now. LOL, only in the world of a delusional moron is a 2 game winning streak "competitive". Points in 7 straight games, idiot. That's competitive. Lets not forget lately the stellar play of White and Kaberle. I agreed with Don during the post game that White has really stepped up.